No doubt „a must visit“ destination in Singapore. At such a tourist spot someone does not expect an extraordinary service or even good food. We were wrong. After enjoying the breathtaking view we went to the restaurant (either come before 12.30h for lunch or book a table) and have been received by the two waitresses Rita and Cherie with a big smile. We thoroughly enjoyed the menu of the day and considering the “credited amount” of the fare to the top the price is more than acceptable. Definitely a place to recommend. Thank you very much for taking the time to highlight your latest experience at our Restaurant. It was truly a pleasure to read. On behalf of the team, we thank you for your gracious compliments & I have passed your wonderful comments to the entire team. I hope we will have the opportunity to welcome you back in the near future. 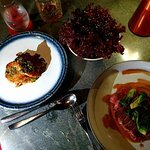 Please do not hesitate to contact me personally by email at john.zara@celavi.com should you need any further assistance or wish to dine with us in the future. Beautiful view, great atmosphere and service from Sandeep who catered to our every need. Well done Sandeep!! We initially came on the advice of the hotel staff when we stayed at the MBS in November 2018. I am vegetarian so my partner made sure to organise a meal where I could enjoy the cuisine as much as he could enjoy the meat! We were seated outdoors and had a stunning view over the bay, it was really special. We tried to re-capture the memory on our second trip to Singapore at the beginning of March however we were very disappointed. We started by ordering an entree of some bread and cheese. The cheese was delicious but the bread was hard as a rock and stone cold. When was this dish prepared, yesterday? We thought we would at least have some more luck with the mains. Nope. 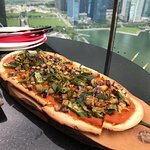 As it turns out they have recently changed their menu, removing all of the vegetarian items (there used to be a separate vegetarian menu, which no longer exists). The staff were reasonably polite, but not particularly accommodating. I was initially offered a curry, which was then later changed to a plate of hot cabbage with some tofu skin on top. Why have I paid nearly $400 to eat a plate of cabbage?? The meat dish my partner ordered was equally unappealing, a few dry pieces of pork on a red smear stuck to the plate. Apparently the red stuff might have been fermented tofu, but who knows as the only thing coming off that plate was the few pieces of pork. To top things off, we were seated indoors this time so there was hardly a view. It turned out to be fine as the real "wow" factor fades quickly once you have already visited. We left totally unimpressed and made a stop on the way home to a hawker centre to get some proper food with the change left on the bill. 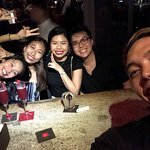 To sum it all up, there's so much delicious food in Singapore, so why would you waste time and (a lot of) money eating in a nightclub? If you must see the view, come for a drink only and get a real meal elsewhere. Thank you very much for your candid review of your recent experience at our venue. Your feedback is extremely valuable to us, as we strive to improve with each and every guests that comes and experiences Ce La Vi. My deepest apologies for the major shortcomings in food and service you were left feeling rather dissatisfied & were not able to enjoy the evening as originally intended. I would like to assure you that here at CE LA VI we do pride ourselves on excellent guest care. Since we fell short on this occasion, we sincerely hope to get the opportunity to welcome you and your guests back for another visit with the hope that we can redeem ourselves. Please reach out to me directly at john.zara@celavi.com if you would be willing to give us a chance to turn your experience around. 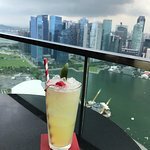 Best view in Singapore with Best cocktails in your hand to compliment it. Food needs improvement as I feel that they are trying too hard to be someone they are not. Simple is the solution. Thank you for bringing your experience to our attention and I apologize that the food was not up to your expectations. We will take note of your feedback so all our diners are able to enjoy exceptional experiences. We do hope your recent experience does not deter you from returning as we look forward to welcoming you back. Thank you once again for choosing CE LA VI. Thank you for your gracious compliments. 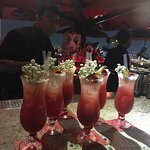 We are delighted to know that you had an amazing experience with us at Ce La Vi and enjoyed the great variety of food and drinks we have to offer. Your words encourage us to continue striving to provide a memorable dining experiences for all our guests. We certainly hope to have the pleasure of seeing you back at our iconic venue in the future. Been to CE LA VI Restaurant? Share your experiences!